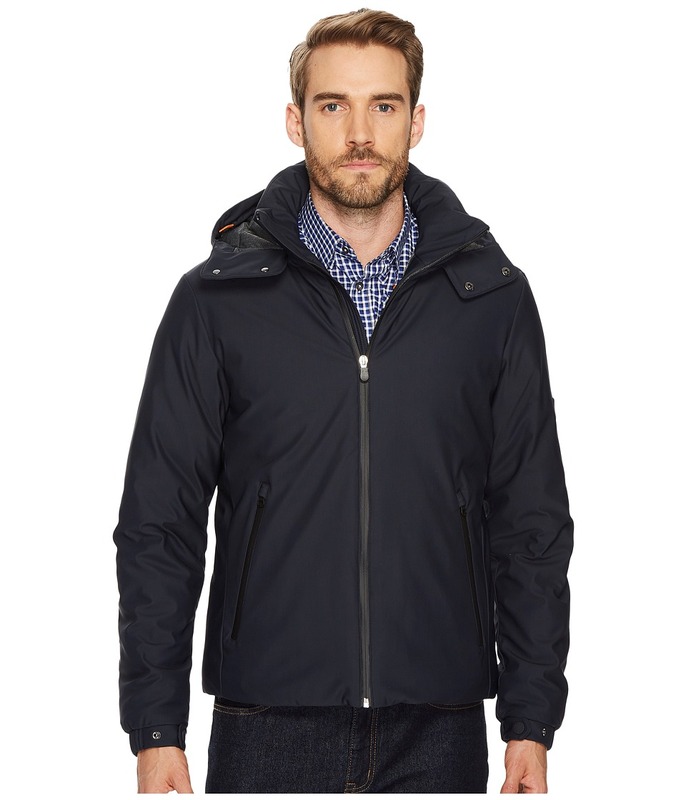 A breathable midlayer jacket that~s ideal for cool weather and can even be worn under a regular coat for added warmth. 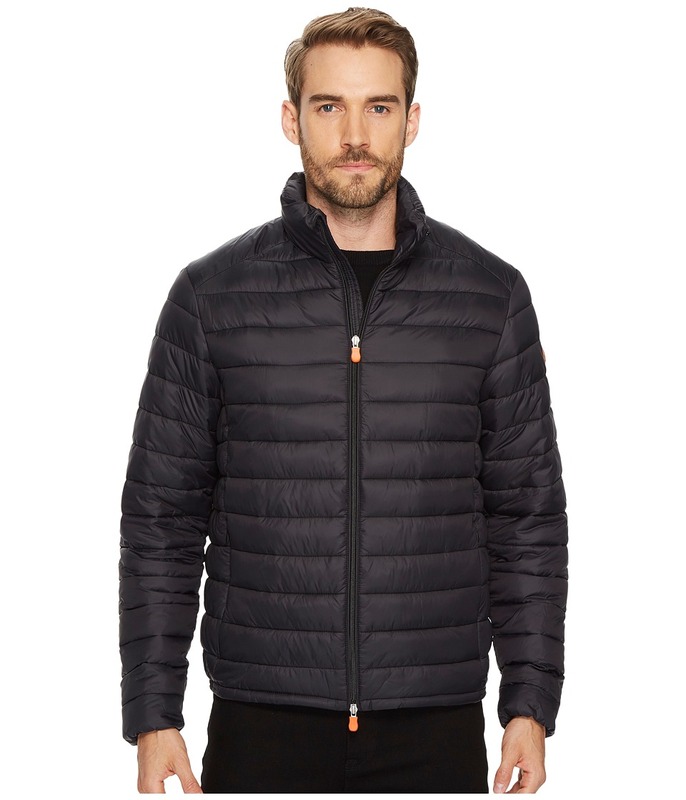 Stretch puffer jacket features animal-free synthetic PLUMTECH&amp#174 fill. PLUMTECH padding imitates the fluffiness of down while preserving the advantages of technological thermal insulation. It absorbs high levels of humidity and dries very quickly. Lastly, thanks to the high density of PLUMTECH fiber, it can trap an extremely large quantity of air (the best thermal insulation) in its structure, preserving the body~s natural temperature and guaranteeing optimal comfort. Stand collar. Two-way front zip closure. Onseam zipper welt hand pockets. Logo patch on sleeve. Jacket is packable and fits neatly in the included drawstring pouch. Lined. Style #D3243M-ANGY3. Shell and Lining: 55 percent polyester, 45 percent nylon Fill: 100 percent polyester. Machine wash, hang dry. Imported. Measurements: Length: 27 in Product measurements were taken using size MD. Please note that measurements may vary by size. A versatile midlayer that~s perfect for any adventure where layering for warmth is essential. 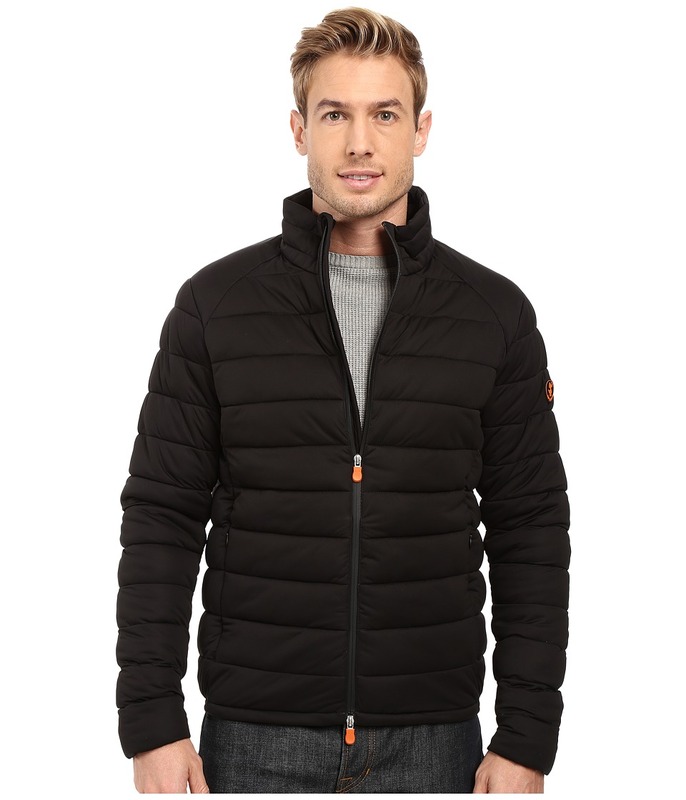 Solid stretch puffer jacket features animal-free synthetic PLUMTECH&amp#174 fill. PLUMTECH padding imitates the fluffiness of down while preserving the advantages of technological thermal insulation. It absorbs high levels of humidity and dries very quickly. Lastly, thanks to the high density of PLUMTECH fiber, it can trap an extremely large quantity of air (the best thermal insulation) in its structure, preserving the body~s natural temperature and guaranteeing optimal comfort. Stand collar. Two-way front zip closure. Onseam zipper welt hand pockets. Logo patch on sleeve. Jacket is packable and fits neatly in the included drawstring pouch. Lined. Style #D3243M-SOLD3. Shell: 100 percent polyester Lining: 55 percent polyester, 45 percent nylon Fill: 100 percent polyester. Machine wash, hang dry. Imported. Measurements: Length: 27 in Product measurements were taken using size MD. Please note that measurements may vary by size. 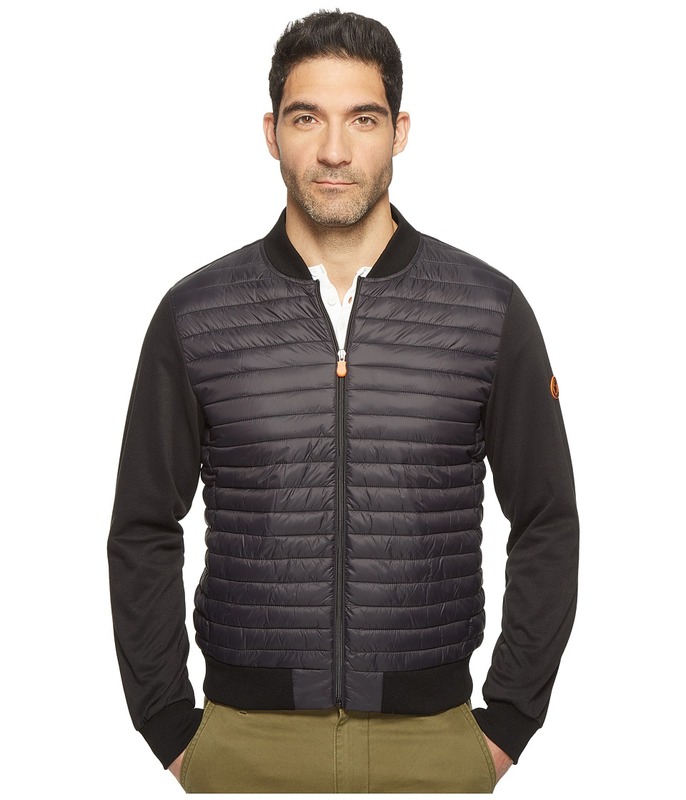 A versatile vest that offers protection from wet weather. 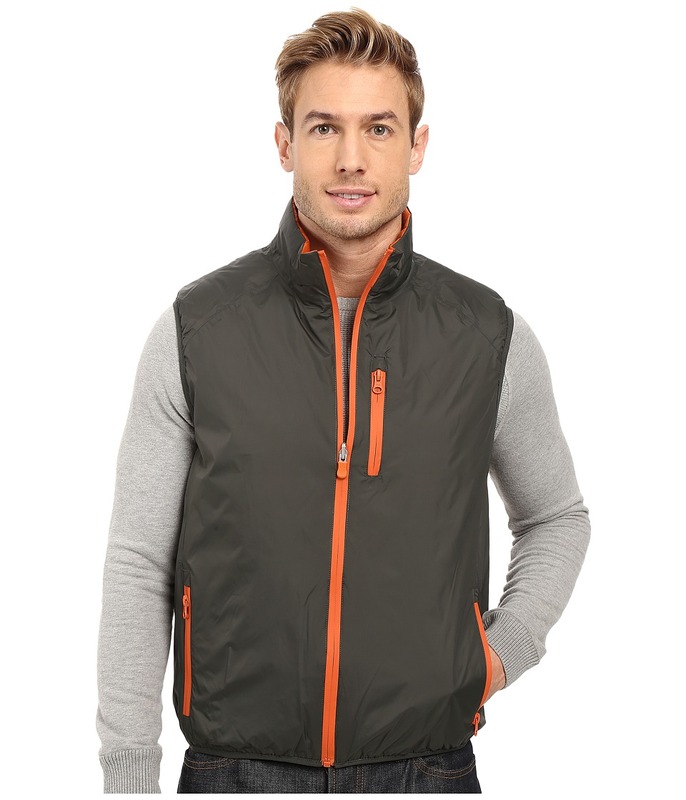 Reversible vest features animal-free synthetic PLUMTECH&amp#174 fill. PLUMTECH padding imitates the fluffiness of down while preserving the advantages of technological thermal insulation. It absorbs high levels of humidity and dries very quickly. Lastly, thanks to the high density of PLUMTECH fiber, it can trap an extremely large quantity of air (the best thermal insulation) in its structure, preserving the body~s natural temperature and guaranteeing optimal comfort. Water and abrasion-resistant nylon fabric boasts fully taped seams to keep the wet out. One side is quilted while the other side is smooth. Stand collar. Full zip front closure. Zipper Napolean chest pocket. Zipper welt hand pockets. Vest is packable and fits neatly in the included drawstring pouch. Style #D8387M. 100 percent polyester. Machine wash, hang dry. Imported. Measurements: Length: 26 in Product measurements were taken using size MD. Please note that measurements may vary by size. Your style game is on-point. High-definition nylon quilted panels with animal-free synthetic PLUMTECH fill. PLUMTECH padding imitates the fluffiness of down while preserving the advantages of technological thermal insulation. It absorbs high levels of humidity and dries very quickly. Lastly, thanks to the high density of PLUMTECH fiber, it can trap an extremely large quantity of air (the best thermal insulation) in its structure, preserving the body~s natural temperature and guaranteeing optimal comfort. Lightweight jacket packs into its own bag for easy travel. Rib-knit detail at neck, cuffs and hem. Mock collar. Full zip-up front. Long sleeves with banded cuffs. Side-seam hand pockets. Straight hemline. Outershell A: 75 percent polyester, 25 percent cotton Outershell B: 100 percent nylon Lining: 100 percent nylon Filling: 100 percent polyester. Machine wash warm, line dry. Imported. Measurements: Length: 26 in Product measurements were taken using size MD. Please note that measurements may vary by size. Travel light without sacrificing warmth in the packable Save the Duck Full Zip Knit Nylon Hoodie. 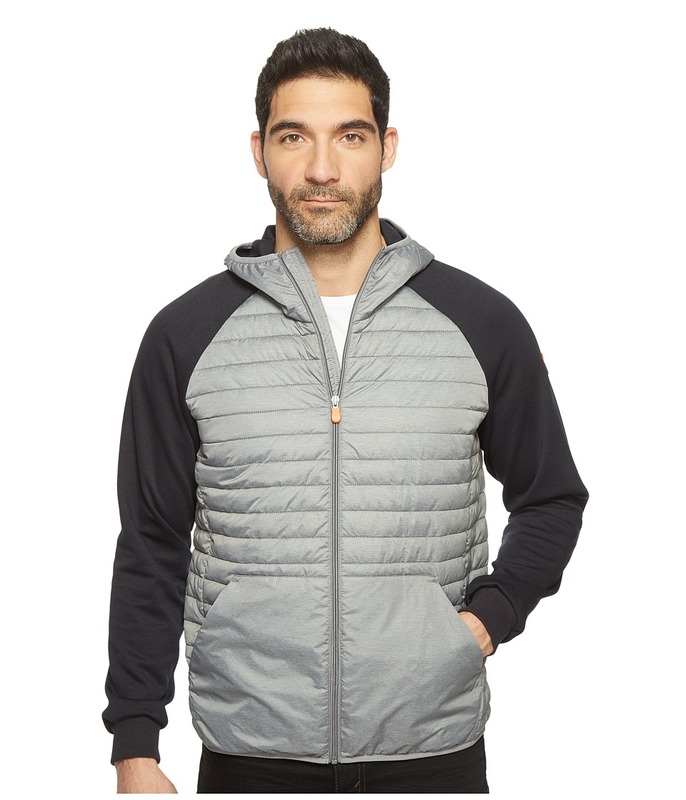 Lightweight hoodie features quilted panels with animal-free synthetic PLUMTECH fill. PLUMTECH padding imitates the fluffiness of down while preserving the advantages of technological thermal insulation. It absorbs high levels of humidity and dries very quickly. Lastly, thanks to the high density of PLUMTECH fiber, it can trap an extremely large quantity of air (the best thermal insulation) in its structure, preserving the body~s natural temperature and guaranteeing optimal comfort. Full-time, three-panel hood. Full zip-up front. Long raglan sleeves with rib-knit cuffs. Split kangaroo pockets. Interior pocket. Straight hemline. Outershell A: 65 percent polyester, 35 percent nylon Outershell B: 75 percent polyester, 25 percent cotton Hood Lining: 65 percent polyester, 35 percent nylon Filling: 100 percent polyester. Machine wash warm, do not tumble dry. Imported. Measurements: Length: 27 in Product measurements were taken using size MD. Please note that measurements may vary by size. Build a bonfire and watch the sunset with friends while sporting a Save the Duck reversible jacket. Windbreaker features quilted animal-free synthetic PLUMTECH fill on one side and smooth nylon on the other side. Lightweight jacket is packable and comes with a Save The Duck bag so you can travel light without sacrificing warmth. PLUMTECH padding imitates the fluffiness of down while preserving the advantages of technological thermal insulation. It absorbs high levels of humidity and dries very quickly. Lastly, thanks to the high density of PLUMTECH fiber, it can trap an extremely large quantity of air (the best thermal insulation) in its structure, preserving the body~s natural temperature and guaranteeing optimal comfort. Water and abrasion-resistant nylon fabric boasts fully taped seams to keep the wet out. Full-time hood. Full zip-up front closure. Zip hand pockets on each side of the jacket. Long sleeves with elastic cuffs. Straight hemline. Outershell: 100 percent nylon Lining: 65 percent polyester, 35 percent nylon Filling: 100 percent polyester. Machine wash cold, line dry. Imported. Measurements: Length: 23 in Product measurements were taken using size 1 (SM). Please note that measurements may vary by size. A Save the Duck Basic Non Hood Coat is anything but! Pairing an ultralight construction with duck-protecting synthetic insulation, this fitted puffer coat shields you from the cold without weighing you down. 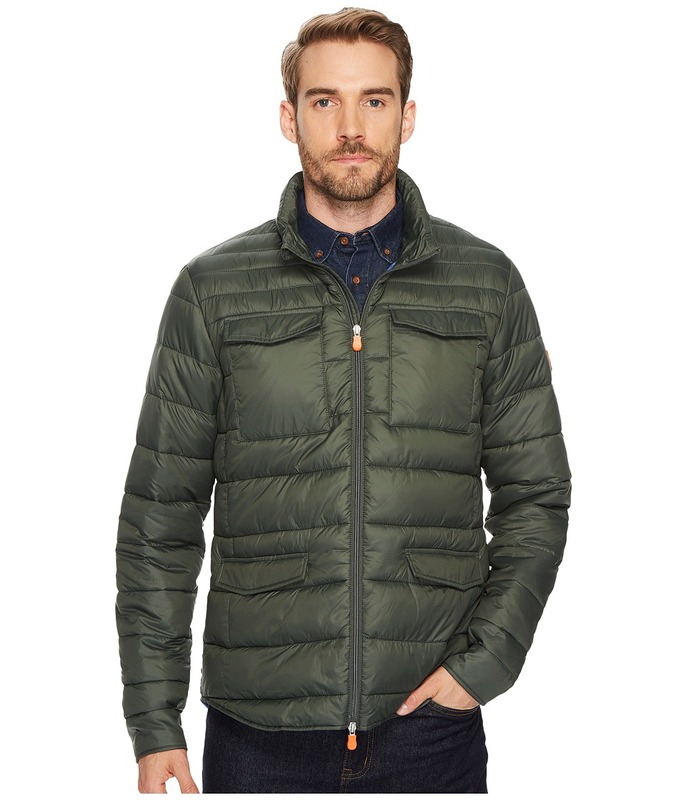 Insulated coat is constructed in a classic, puffer-jacket silhouette. Highly packable design compresses into an integrated stuff sack. Giga Skinny fabric : &amp#8226 High-definition nylon weave is designed for ultralightweight performance that maintains a fluffy, high loft. &amp#8226 Specialized fabric is thin and light while maintaining abrasion resistance for cross-season wear. &amp#8226 Tightly woven design provides wind-resistant, water-resistant protection. &amp#8226 Synthetic fibers create a hydrophobic face that speeds the passage of moisture vapor from perspiration, promoting breathability and quick-dry performance. &amp#8226 Quick-dry design decreases internal humidity in order to resist accumulation of odor-causing mold. PLUMTECH Insulation : &amp#8226 Leave the down on the duck! PLUMTECH insulation is expertly crafted in order to not only imitate the properties of natural down but improve on them. &amp#8226 Unlike traditional polyfill batting, PLUMTECH insulation utilizes padding created in order to match the fluffy, high-loft properties of down. &amp#8226 Ultralightweight construction reduces bulk and encumbrance in order to maintain natural range of motion. &amp#8226 While insulation is lightweight, it maintains a high density of fibers increasing both surface area of fibers and quantity of air pockets in order to trap a greater degree of warmth. &amp#8226 Synthetic fibers create a hydrophobic face that speeds the passage of moisture vapor from perspiration, promoting breathability and quick-dry performance. &amp#8226 Quick-dry design decreases internal humidity in order to resist accumulation of odor-causing mold. Stand collar with zipper garage. Two-way zip with inner draft flap. Long sleeves with saddle shoulder panel. Zip hand pockets. Straight hem with elastic binding. Rubber logo patch placed at the left sleeve. All Save The Duck factories meet the following independent, third-party certification standards: &amp#8226 Business Social Compliance Initiative (BSCI) certification sets out 11 core labor rights which the Save The Duck factories implement within their entire supply chain. &amp#8226 Worldwide Responsible Accredited Production (WRAP) certification combines principles of international workplace standards, local laws and workplace regulations, and the spirit or language of relevant International Labor Organization (ILO) conventions. These principles represent a top-down approach holding human resources, health and safety, environmental practices, and legal compliance to the same set of standards. &amp#8226 Bluesign Certificate partners are committed to meeting the highest criteria of sustainability, focusing on resource efficiency, environmental impact, occupational health and safety of laborers, and consumer protection. &amp#8226 The OEKO-TEX Certificate stands for Confidence in Textiles, providing independent textile texting. They work for enhanced product safety and sustainable production in the textile production chain through continuous improvement. Body: 100 percent nylon Lining: 100 percent nylon Fill: 100 percent polyester. Machine wash and line dry. Imported. Measurements: Length: 27 in Product measurements were taken using size MD. Please note that measurements may vary by size. Designed after a classic M-65 jacket, the Save the Duck Field Jacket combines time-tested military styling with modern, ultralight construction and insulation for premium wear from trail to town. Packable puffer jacket stuffs into an attached inner stuff sack. Giga fabric : &amp#8226 High-definition nylon weave is designed for ultralightweight performance that maintains a fluffy, high loft. &amp#8226 Specialized fabric is thin and light while maintaining abrasion resistance for cross-season wear. 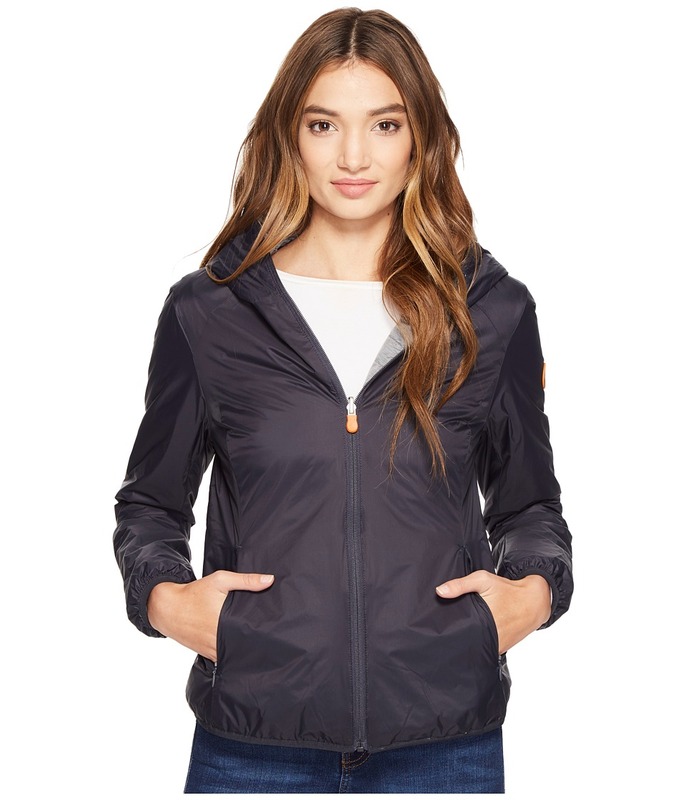 &amp#8226 Tightly woven design provides wind-resistant, water-resistant protection. &amp#8226 Synthetic fibers create a hydrophobic face that speeds the passage of moisture vapor from perspiration, promoting breathability and quick-dry performance. &amp#8226 Quick-dry design decreases internal humidity in order to resist accumulation of odor-causing mold. PLUMTECH Insulation : &amp#8226 Leave the down on the duck! PLUMTECH insulation is expertly crafted in order to not only imitate the properties of natural down but improve on them. &amp#8226 Unlike traditional polyfill batting, PLUMTECH insulation utilizes padding created in order to match the fluffy, high-loft properties of down. &amp#8226 Ultralightweight construction reduces bulk and encumbrance in order to maintain natural range of motion. &amp#8226 While insulation is lightweight, it maintains a high density of fibers increasing both surface area of fibers and quantity of air pockets in order to trap a greater degree of warmth. &amp#8226 Synthetic fibers create a hydrophobic face that speeds the passage of moisture vapor from perspiration, promoting breathability and quick-dry performance. &amp#8226 Quick-dry design decreases internal humidity in order to resist accumulation of odor-causing mold. Stand collar with zipper garage. Non-insulated, three-piece hood rolls out of the collar. Two-way zip with inner draft flap. Double snap-button cuffs. Snap-flap chest pockets. Snap-flap hand pockets. Inner flap pocket. Shirttail hemline. Logo patch placed at the left sleeve. All Save The Duck factories meet the following independent, third-party certification standards: &amp#8226 Business Social Compliance Initiative (BSCI) certification sets out 11 core labor rights which the Save The Duck factories implement within their entire supply chain. &amp#8226 Worldwide Responsible Accredited Production (WRAP) certification combines principles of international workplace standards, local laws and workplace regulations, and the spirit or language of relevant International Labor Organization (ILO) conventions. These principles represent a top-down approach holding human resources, health and safety, environmental practices, and legal compliance to the same set of standards. &amp#8226 Bluesign Certificate partners are committed to meeting the highest criteria of sustainability, focusing on resource efficiency, environmental impact, occupational health and safety of laborers, and consumer protection. &amp#8226 The OEKO-TEX Certificate stands for Confidence in Textiles, providing independent textile texting. They work for enhanced product safety and sustainable production in the textile production chain through continuous improvement. Body: 100 percent nylon Lining: 100 percent nylon Fill: 100 percent polyester. Machine wash and line dry. Imported. Measurements: Length: 30 in Product measurements were taken using size MD. Please note that measurements may vary by size. Where other gear weights you down, a Save the Duck coat keeps you moving easily through inclement conditions. 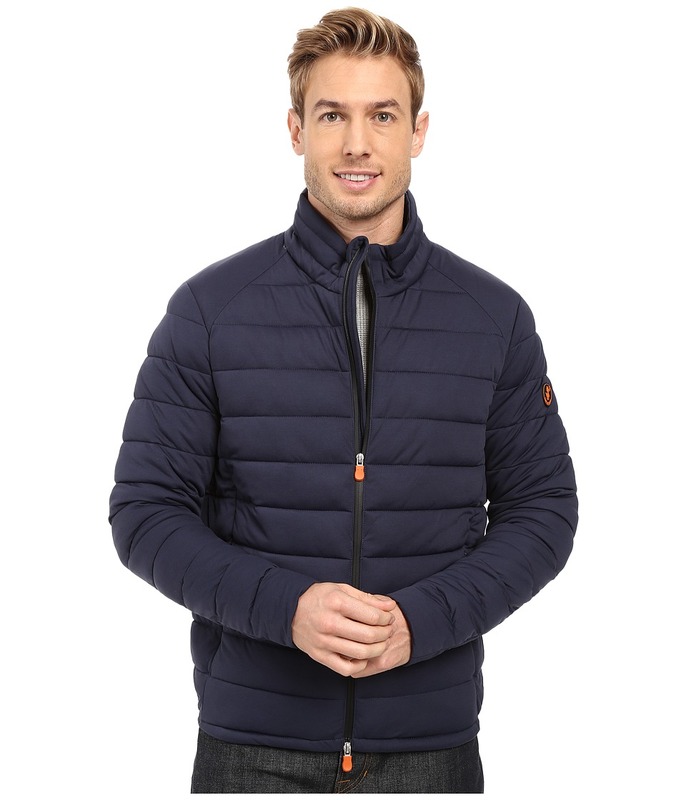 A combination of highly resistant stretch, waterproof and breathable performance, and signature Save the Duck PLUMTECH insulation make this coat an essential piece for cold and wet conditions. Packable coat stuffs into an attached inner stuff sack. Flex Stretch fabric : &amp#8226 State-of-the-art fabric is designed to provide excellent freedom of movement without sacrificing weatherproof performance. &amp#8226 Bi-elastic fabric interweaves stretch fibers in the warp and weft for movement-mirroring stretch and full range of motion. &amp#8226 Integrated inner membrane provides both waterproof and breathable protection with a 3000 mm/24h / 3000-5000 g/m2/24h rating. &amp#8226 Fabric is woven for durability, maintaining abrasion resistance for cross-season wear. &amp#8226 Synthetic fibers create a hydrophobic face that speeds the passage of moisture vapor from perspiration, promoting breathability and quick-dry performance. &amp#8226 Quick-dry design decreases internal humidity in order to resist accumulation of odor-causing mold. PLUMTECH Insulation : &amp#8226 Leave the down on the duck! PLUMTECH insulation is expertly crafted in order to not only imitate the properties of natural down but improve on them. &amp#8226 Unlike traditional polyfill batting, PLUMTECH insulation utilizes padding created in order to match the fluffy, high-loft properties of down. &amp#8226 Ultralightweight construction reduces bulk and encumbrance in order to maintain natural range of motion. &amp#8226 While insulation is lightweight, it maintains a high density of fibers increasing both surface area of fibers and quantity of air pockets in order to trap a greater degree of warmth. &amp#8226 Synthetic fibers create a hydrophobic face that speeds the passage of moisture vapor from perspiration, promoting breathability and quick-dry performance. &amp#8226 Quick-dry design decreases internal humidity in order to resist accumulation of odor-causing mold. Attached, three-piece hood with adjustable drawcord. Hood hangs separately from the stand collar. Full-length zip with inner draft flap. Elastic-paneled cuffs with adjustable snap-button tab. Zip hand pockets. Inner zip pocket. Straight hemline. All Save The Duck factories meet the following independent, third-party certification standards: &amp#8226 Business Social Compliance Initiative (BSCI) certification sets out 11 core labor rights which the Save The Duck factories implement within their entire supply chain. &amp#8226 Worldwide Responsible Accredited Production (WRAP) certification combines principles of international workplace standards, local laws and workplace regulations, and the spirit or language of relevant International Labor Organization (ILO) conventions. These principles represent a top-down approach holding human resources, health and safety, environmental practices, and legal compliance to the same set of standards. &amp#8226 Bluesign Certificate partners are committed to meeting the highest criteria of sustainability, focusing on resource efficiency, environmental impact, occupational health and safety of laborers, and consumer protection. &amp#8226 The OEKO-TEX Certificate stands for Confidence in Textiles, providing independent textile texting. They work for enhanced product safety and sustainable production in the textile production chain through continuous improvement. 42 percent polyester, 36 percent nylon, 13 percent spandex, 9 percent polyurethane Lining: 55 percent nylon, 45 percent polyester Fill: 100 percent polyester. Machine wash and line dry. Imported. Measurements: Length: 27 1 2 in Product measurements were taken using size MD. Please note that measurements may vary by size.